Good morning. It's Wednesday, Aug. 15. • Concern for the couple linked to the start of the Carr fire. 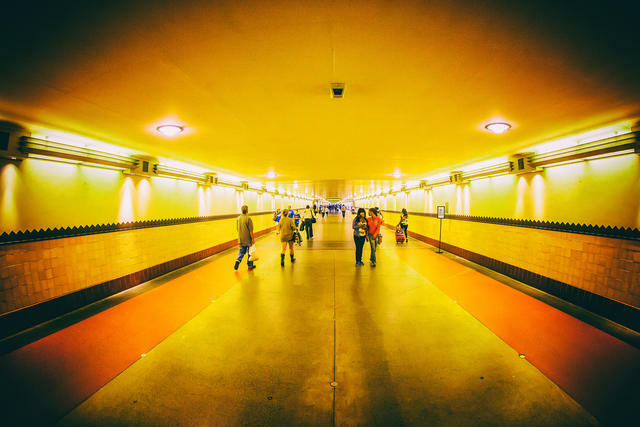 • Los Angeles's subway will become the first to scan riders. 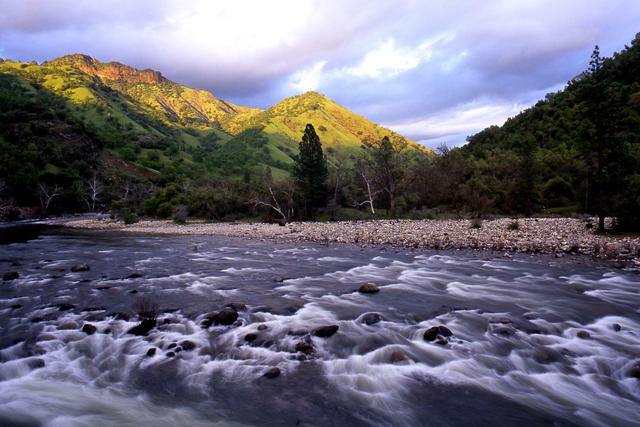 • And a naturalist shares his eight favorite California rivers. 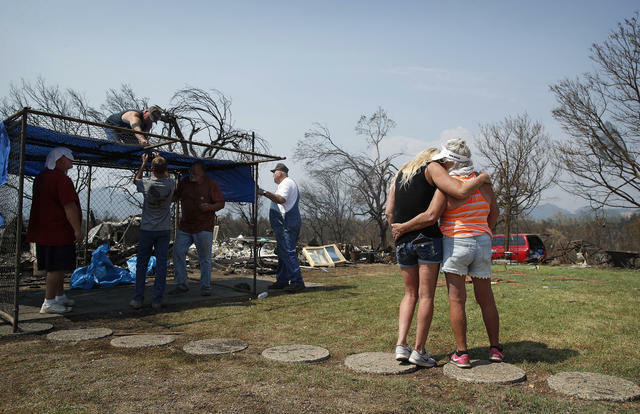 Family members gathered at the ruins of their home in Redding last Saturday. People in Shasta County could be forgiven for feeling anger toward the elderly couple whose blown trailer tire was blamed for igniting the devastating Carr fire. But according to a report in the Record Searchlight, when word got around that the couple was plagued by guilt — the wife "crying day and night" — the community expressed another sentiment: It's not your fault. A Redding woman, Rachel Pilli, posted a Facebook message sharing concern for the couple, whose names haven't been released. That led people to ask if they could send messages of encouragement. So far, about 100 cards have been collected, along with gifts and flowers. “I think the fire has caused us to look into each other’s eyes and discover the human kindness in us,” Pilli said. Read the story in the Record Searchlight. Indigenous tribes in the Klamath region used controlled burns to mitigate wildfires. Their role is now being restored. A century ago, a memo by a U.S. Forest Service ranger declared “renegade Indian” fires were rooted in “pure cussedness.” As overgrown forests erupted in monster fires, attitudes changed. 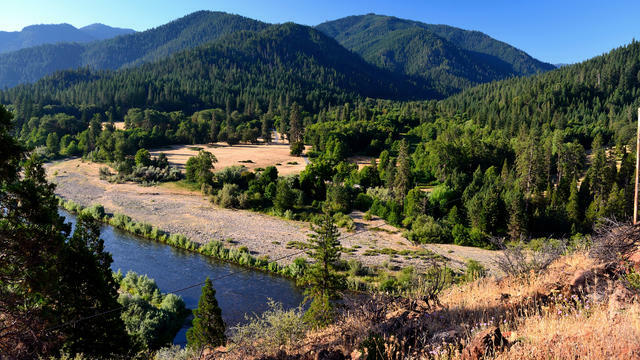 Now, the Forest Service has signed a new plan for managing public forest lands that lets tribes like California's Karuk continue their tradition of controlled burns. The early enthusiasm for California's legal marijuana market has turned to frustration. One major complaint: Roughly half of the state's residents live in jurisdictions that prohibit cannabis stores and delivery services. In an editorial, the L.A. Times argued that marijuana isn't really legal if residents don't have a reasonable way to buy it. 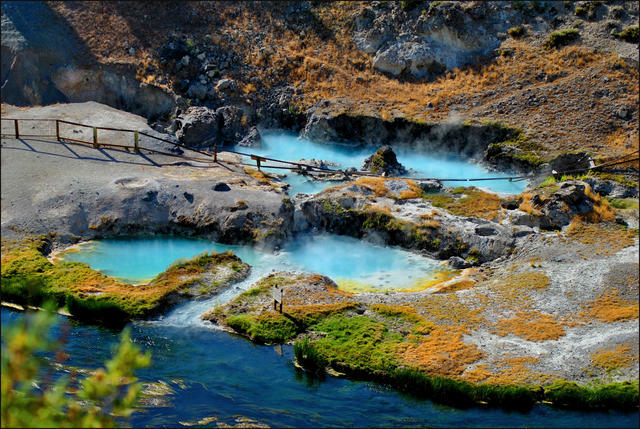 The blue pools at Hot Creek Geologic Site are part of the Long Valley Caldera. Scientists have discovered 240 cubic miles of semi-molten magma below the Long Valley Caldera, a depression adjacent to Mammoth Mountain that was formed from a gigantic volcanic eruption 760,000 years ago. Another major eruption is considered unlikely, but the caldera may have some smaller ones left in it. Accusations of police officer misconduct led Bay Area prosecutors to throw out 19 convictions. The incident rocked the criminal justice system and exposed what could happen if California's courts — and the public — actually knew what was in officers’ disciplinary files. Vegetables at a Berkeley farmer's market. The generation of Californians that got into organic farming in the 1970s is now ready for younger farmers to take over. But with farm income lagging behind the value of the land, few are stepping up. 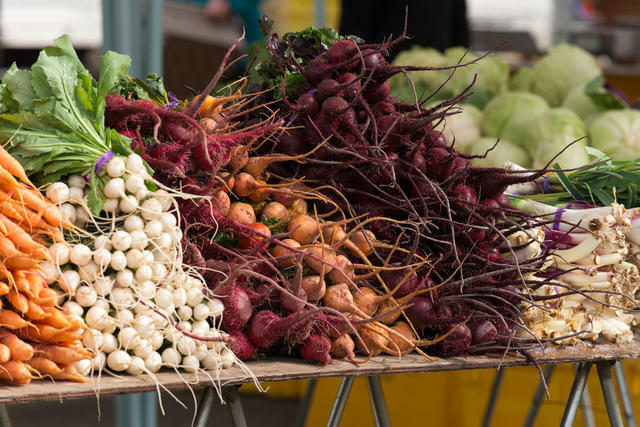 “I believe very deeply that we lose something precious to who we are as a species if we aren’t engaged with the land we are dependent upon," one farmer said. Joshua Ryan Pawlik, 31, suffered from schizoaffective disorder and a drug addiction. 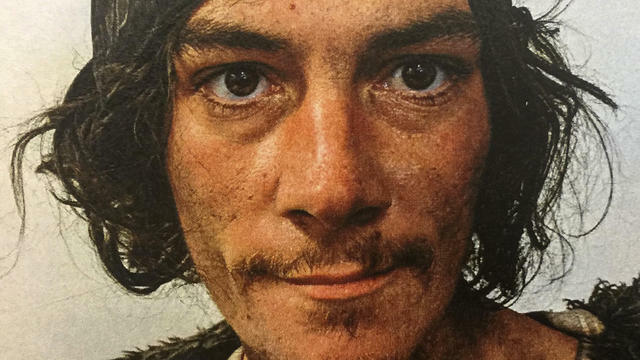 Joshua Ryan Pawlik, homeless and mentally ill, appeared to be unconscious in an alleyway last March when Oakland police officers surrounded him and fatally shot him. The killing resembled others in which officers, guns drawn, roused sleeping people and ordered them to surrender weapons under threat of lethal force. Officials have witheld body camera footage of the Pawlik shooting. Rural Amador County has one of the state's highest suicide rates. Isolation, substance abuse, and financial stress are factors. And there's another problem: The entire county has just one psychiatrist. "We just can’t convince young health care professionals that this is a good place to be,” a local physician said. 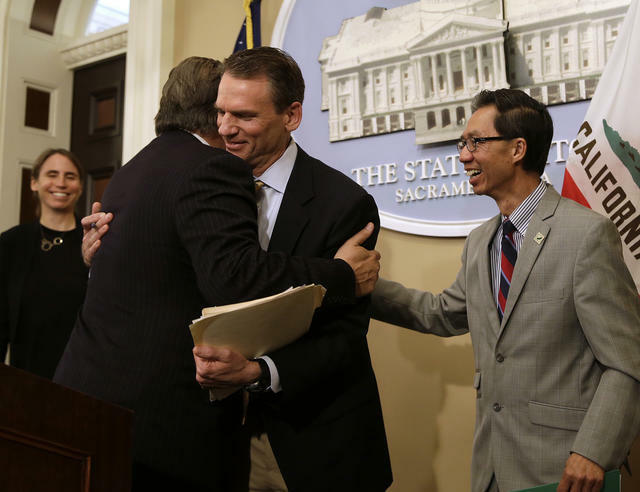 State Sen. Bob Hertzberg, left, and Assemblyman Ed Chau, right, celebrated with Alastair Mactaggart, center, after the approval of a data privacy bill in Sacramento on June 28. For two decades, Facebook and Google made billions of dollars mining your personal data, using wealth, prestige, and Beltway clout to fight off anyone who threatened to stop them. Then an unlikely group of Bay Area activists took them on — and won. People are getting excited about plans for a massive water-park resort in Manteca. Great Wolf Lodge announced that its first Northern California resort — near the edge of the Bay Area — would include a 95,000-square-foot water park, a ropes course, an arcade, miniature golf, and 500 rooms for guests. "The government has given them a death sentence." About 300 women reported having miscarriages at an Air Force base and former weapons storage area in Victorville where immigrant detainees are now being held. The complex was built over a Superfund site — including 33 hazardous chemicals — which advocates say may be harming people's health. Los Angeles’s transit agency said it would be the first in the nation to screen its passengers with body scanners as they enter the subway. They're not expected to slow commuters down. “We’re looking specifically for weapons that have the ability to cause a mass-casualty event,” an official said. The scooter-sharing companies Bird and Lime abruptly deactivated their services in Santa Monica after the city failed to give them a key endorsement to continue operating. About 200 of the companies' supporters swarmed City Hall in protest. The scooters have been at the center of a heated debate over whether they pose a headache or convenience. The Neptune pool has been empty since 2014. 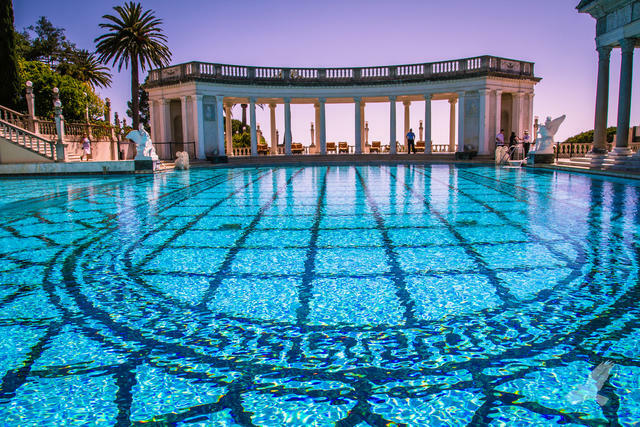 Completed in 1936, the extravagant Neptune pool was the setting for star-studded parties at William Randolph Hearst's hillside castle on the Central Coast. Five years after being emptied during a severe drought, the pool is now being refilled to its former glory. We asked Palmer to share his favorite stretches of California rivers, along with his photographs. He came up with eight from the Oregon border to greater Los Angeles, including what he called the state's "quintessential river." Head over to the California Sun online to see his choices.